Within an initiative, there are many bulk actions you can take the manage all the assets within that initiative. One feature that saves a lot of time is to bulk tag the content with valuable data. Start by navigating to the Initiative Catalog and clicking on the correct Initiative. You'll then select the content that you wish to make adjustments for and then choose the Bulk Actions Menu. Select as many fields and corresponding values as desired. For each field you'd like to tag with, you'll choose Add Another Field and the select the values you'd like to apply. Selecting the optional checkbox to override all current tags for the fields will erase existing tags rather than just adding new. This options only applies to multi-select fields as single-select fields will always override because there is only one option that can be selected for single-select fields. If the optional checkbox is not selected, all values will be tagged along with the existing values on the content asset. 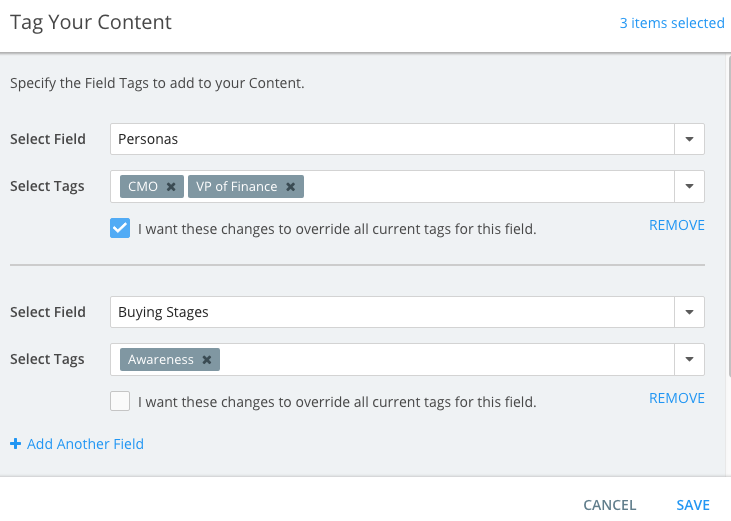 Select the optional checkbox to override all current tags for each field where it applies. In other words, if the optional checkbox to override the values for a field tag is selected, it will only apply to that field. Field Tags is an all encompassing term used to explain custom fields as well as non-custom fields in Kapost like Initiatives, Personas, and Buying Stages. Read more about custom fields on content and initiatives here. Please note that Bulk Tagging is available on the Content Catalog, Initaitive Catalog and in the Gallery as well.